Recipe: Molten Chocolate Cake | Dinner Love. This recipe hails from the September 2008 issue of Food and Wine magazine. These mini chocolate cakes are extremely easy to make and sinfully delicious. 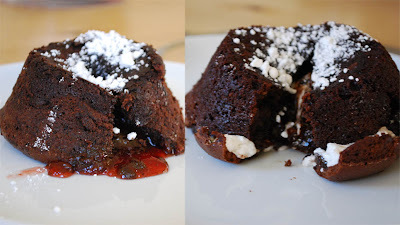 One of the coolest things about them is their versatility–you can use almost anything you like for the filling (I used marshmallow fluff and strawberry jam) or if you don’t have a filling at all, the cake naturally creates its own molten chocolate center. Yum. Note that I cut this recipe in half in order to only make two cakes. My boyfriend and I don’t need any more excuses to pig out than we already do! Preheat the oven to 425 degrees. Grease two ramekins. The recipe says to use melted butter for this, but I used veggie oil. Why? I’m a rebel. Also, the point of this is to ensure that the cake doesn’t stick to the ramekins. I figured that veggie oil would work just as well. (It did.) I’m also lazy. Very, very lazy. Mix together the cocoa powder and the 1 TB flour, and dust the greased ramekins. Chop the chocolate and melt over low heat with the butter. While it melts, whisk together the egg, sugar and salt until thick and pale yellow. Gently fold the melted chocolate into the egg and sugar until there are no visible chocolate streaks. Do the same for the flour. Fill the ramekins 2/3 of the way with the batter, then spoon 1TB of your filling of choice on top, and cover with the remaining batter. Put the ramekins onto a cookie sheet, and bake in the center of the oven for 16 minutes, until the tops are cracked but the center is still slightly jiggly. Look at the crazy marshmallow fluff cake! You will have to take my word for it when I tell you that they had jiggly centers. Allow to cool for 10 minutes. Run a knife around the edge of the cakes to loosen, invert onto a plate, and serve. Top with powdered sugar, if you like. Yummy yummy yum! I lived every child’s dream tonight, as I gleefully ate dessert before dinner.